Jeremy Bentham (15 February 1748 – 6 June 1832) was a British gentleman, jurist, philosopher, and legal and social reformer. He is best known as an early advocate of utilitarianism and animal rights. The result you will find is that to the aggregate stock of happiness of the community, loss not profit is the result of the operation. Priestley was the first (unless it was Beccaria) who taught my lips to pronounce this sacred truth — that the greatest happiness of the greatest number is the foundation of morals and legislation. It is part of a work to which if ever it should be compleated I intend to give some such title as Principles of Legal Policy; the object of it is to trace out a new model for the Laws: of my own country you may imagine, in the first place: but keeping those of other countries all along in view. To ascertain what the Laws ought to be, in form and tenor as well as in matter: and that elsewhere as well as here. All that I shall say to recommend it to you is that I have taken counsel of you much oftener than of our own Ld. Coke and Hale and Blackstone. The repose of Grotius and Puffendorf and Barbeyrac and Burlamaqui I would never wish to see disturbed. I have built solely on the foundation of utility, laid as it is by Helvetius. Becarria has been lucrative pedibus, or if you please manibus, meis. To what shall the character of utility be ascribed, if not to that which is a source of pleasure? Want keeps pace with dignity. Destitute of the lawful means of supporting his rank, his dignity presents a motive for malversation, and his power furnishes the means. Judges of elegance and taste consider themselves as benefactors to the human race, whilst they are really only the interrupters of their pleasure … There is no taste which deserves the epithet good, unless it be the taste for such employments which, to the pleasure actually produced by them, conjoin some contingent or future utility: there is no taste which deserves to be characterized as bad, unless it be a taste for some occupation which has mischievous tendency. Create all the happiness you are able to create: remove all the misery you are able to remove. Every day will allow you to add something to the pleasure of others, or to diminish something of their pains. And for every grain of enjoyment you sow in the bosom of another, you shall find a harvest in your own bosom; while every sorrow which you pluck out from the thoughts and feelings of a fellow creature shall be replaced by beautiful peace and joy in the sanctuary of your soul. It is with government, as with medicine. They have both but a choice of evils. Every law is an evil, for every law is an infraction of liberty: And I repeat that government has but a choice of evils: In making this choice, what ought to be the object of the legislator? He ought to assure himself of two things; 1st, that in every case, the incidents which he tries to prevent are really evils; and 2ndly, that if evils, they are greater than those which he employs to prevent them. There are then two things to be regarded ; the evil of the offence and the evil of the law; the evil of the malady and the evil of the remedy. An evil comes rarely alone. A lot of evil cannot well fall upon an individual without spreading itself about him, as about a common centre. In the course of its progress we see it take different shapes: we see evil of one kind issue from evil of another kind; evil proceed from good and good from evil. All these changes, it is important to know and to distinguish; in this, in fact, consists the essence of legislation. Prose is when all the lines except the last go on to the end. Poetry is when some of them fall short of it. Secrecy is an instrument of conspiracy; it ought not, therefore, to be the system of a regular government. That which has no existence cannot be destroyed — that which cannot be destroyed cannot require anything to preserve it from destruction. Natural rights is simple nonsense: natural and imprescriptible rights, rhetorical nonsense — nonsense upon stilts. But this rhetorical nonsense ends in the old strain of mischievous nonsense for immediately a list of these pretended natural rights is given, and those are so expressed as to present to view legal rights. And of these rights, whatever they are, there is not, it seems, any one of which any government can, upon any occasion whatever, abrogate the smallest particle. Whenever you are about to be oppressed, you have a right to resist oppression: whenever you conceive yourself to be oppressed, conceive yourself to have a right to make resistance, and act accordingly. In proportion as a law of any kind—any act of power, supreme or subordinate, legislative, administrative, or judicial, is unpleasant to a man, especially if, in consideration of such its unpleasantness, his opinion is, that such act of power ought not to have been exercised, he of course looks upon it as oppression: as often as anything of this sort happens to a man—as often as anything happens to a man to inflame his passions,—this article, for fear his passions should not be sufficiently inflamed of themselves, sets itself to work to blow the flame, and urges him to resistance. Submit not to any decree or other act of power, of the justice of which you are not yourself perfectly convinced. If a constable call upon you to serve in the militia, shoot the constable and not the enemy;—if the commander of a press-gang trouble you, push him into the sea—if a bailiff, throw him out of the window. If a judge sentence you to be imprisoned or put to death, have a dagger ready, and take a stroke first at the judge. The principle of utility judges any action to be right by the tendency it appears to have to augment or diminish the happiness of the party whose interests are in question... if that party be the community the happiness of the community, if a particular individual, the happiness of that individual. Nature has placed mankind under the governance of two sovereign masters, pain and pleasure. It is for them alone to point out what we ought to do, as well as to determine what we shall do. On the one hand the standard of right and wrong, on the other the chain of causes and effects, are fastened to their throne. They govern us in all we do, in all we say, in all we think: every effort we can make to throw off our subjection, will serve but to demonstrate and confirm it. In words a man may pretend to abjure their empire: but in reality he will remain subject to it all the while. The principle of utility recognizes this subjection, and assumes it for the foundation of that system, the object of which is to rear the fabric of felicity by the hands of reason and of law. Systems which attempt to question it, deal in sounds instead of sense, in caprice instead of reason, in darkness instead of light. [I]n principle and in practice, in a right track and in a wrong one, the rarest of all human qualities is consistency. 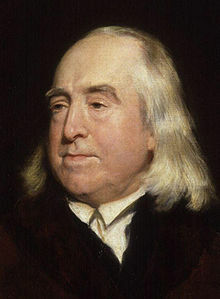 Bentham and his Utilitarians did much to destroy the beliefs which England had in part preserved from the Middle Ages, by their scornful treatment of most of what until then had been the most admired features of the British constitution. And they introduced into Britain what had so far been entirely absent—the desire to remake the whole of the law and institutions on rational principles. I should emphasise that I am largely neglecting here the long history of this revolt, as well as the different turns it has taken in different lands. Long before Auguste Comte introduced the term 'positivism' for the view that represented a 'demonstrated ethics' (demonstrated by reason, that is) as the only possible alternative to a supernaturally 'revealed ethics' (1854:1, 356), Jeremy Bentham had developed the most consistent foundations of what we now call legal and moral positivism: that is, the constructivistic interpretation of systems of law and morals according to which their validity and meaning are supposed to depend wholly on the will and intention of their designers. Bentham is himself a late figure in this development. This constructivism includes not only the Benthamite tradition, represented and continued by John Stuart Mill and the later English Liberal Party, but also practically all contemporary Americans who call themselves 'liberals' (as opposed to some other very different thinkers, more often found in Europe, who are also called liberals, who are better called `old Whigs', and whose outstanding thinkers were Alexis de Tocqueville and Lord Acton). This constructivist way of thinking becomes virtually inevitable if, as an acute contemporary Swiss analyst suggests, one accepts the prevailing liberal (read 'socialist') philosophy that assumes that man, so far as the distinction between good and bad has any significance for him at all, must, and can, himself deliberately draw the line between them (Kirsch, 1981:17). The Benthamic standard of “the greatest happiness” was that which I had always been taught to apply; I was even familiar with an abstract discussion of it, forming an episode in an unpublished dialogue on Government, written by my father on the Platonic model. Yet in the first pages of Bentham it burst upon me with all the force of novelty. What thus impressed me was the chapter in which Bentham passed judgment on the common modes of reasoning in morals and legislation, deduced from phrases like “law of nature,” “right reason,” “the moral sense,” “natural rectitude,” and the like, and characterized them as dogmatism in disguise, imposing its sentiments upon others under cover of sounding expressions which convey no reason for the sentiment, but set up the sentiment as its own reason. It had not struck me before, that Bentham’s principle put an end to all this. The feeling rushed upon me, that all previous moralists were superseded, and that here indeed was the commencement of a new era in thought. John Stuart Mill, Autobiography (1873), Ch. 3: Last Stage of Education and First of Self-Education. Ethical hedonism was originally tied to psychological hedonism about human motivation. Bentham assumed that all humans are basically and exclusively motivated by the desire to gain pleasure and avoid pain, but it is possible to maintain ethical hedonism while rejecting, as most present utilitarians are inclined to do, psychological hedonism. However, certain later and contemporary versions of utilitarianism broaden the notion of ethical hedonism so that human or personal good is understood to be constituted by whatever satisfies people's desires or preferences or makes people happy. For as a hedonist, Bentham apparently bases moral status not on the dignity of rational nature but rather solely on the capacity to feel pleasure and pain. And this is clearly different from the Kantian position. Yet I claim that Bentham’s idea here is in general terms not inconsistent with Kantian ethics but is instead a corollary of the Kantian position. I would even claim that Kantian ethics provides a better justification for it than Bentham’s hedonism–a shallow empiricist doctrine that cannot account properly even for the values it assigns to pleasure and pain in human beings. […] Nonhuman animals do not have the capacity to reason or to talk. Therefore, beyond making the obvious point that they are not persons in the strict sense, whether they have or lack these capacities is irrelevant to how we should treat them. Bentham is therefore correct in telling us not to ask about these matters when we are deciding how to treat animals. What is relevant, because it relates their capacities to those of rational nature, is the fact that they can suffer, and desire, and sometimes also care – about members of their own species, or even occasionally about members of other species, such as humans. Bentham is therefore also correct in telling us what we should ask about these capacities, for they are the relevant ones. Bentham is correct, however, not because Kant is wrong, but because Kant is right. The Bentham Project at University College London. Includes a history of the Auto-Icon, Neologisms of Jeremy Bentham (words he created, including international, maximize and minimize), and details of Bentham's will. "Jeremy Bentham at the Edinburgh Festival Fringe 2007"